Ronald Pickup (born 7 june 1940) is a British actor who played Mr. Barrymore in 1988 in The Hound of the Baskervilles of the TV series Sherlock Holmes with Jeremy Brett as Sherlock Holmes. In 1990, he played Sherlock Holmes in radio show The Singular Case of Sherlock H. and Sigmund F. with Norman Rodway as Dr. Watson. 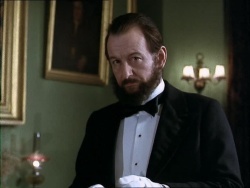 In 2001, he played Sir John Starr in the episode The White Knight Stratagem of the TV series Murder Rooms: Mysteries of the Real Sherlock Holmes with Ian Richardson as Dr. Joseph Bell and Charles Edwards as Arthur Conan Doyle.